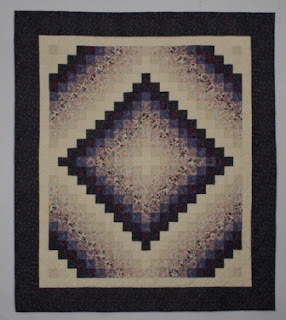 Bonnie Hunter at Quiltville is having a link to share our first quilt. This trip around the world is my very first quilt made in 1995. I took a class with my mom, Betty. Jan Gravey was our teacher. I remember having to be shown how to sew a 1/4 inch seam and thought that was hard. The other ladies were so fast. The class was just one day so I did not get much done that first day. 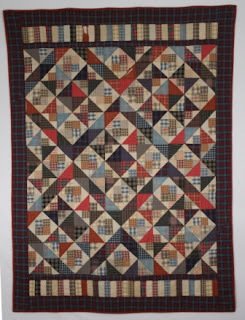 My mom had quilted when I was a child in the 70's and in her last few years of work the 90's, she had singed up for many new quilt classes. How the rotary cutter had changed things. Mom helped me finish the quilt by showing me all the steps she had learned. Miter corners, basting and machine quilting, sewing on binding like she had learned. I have not used this quilt much. It was too special to start with and now the others are nicer. This was not my second quilt but it an early one and has a special place in our house. This is the first quilt I made for my husband Brad. Our first Baby Wyatt was born midway though making it. I gave it to my husband for Christmas that year 1997. I remember him coming into the sewing room and saying "hay I like that. What is it for?" Crap he knows I am making it now. It is the most worn out and used quilt. The kids are always trying to take it first as it is so soft. I did not quilt it but I tied it with red floss. It has a red fabric that is rotting and falling apart. Rather than fix those patches I made Brad a New Quilt two years ago. He is not sharing the new quilt. My boys have many of their own quilts but like to steal dad's quilts. Well, I think these are pretty impressive for your first ones!!!! I remember thinking what is the big deal about 1/4 inch seams. The first block with triangles in it, I got it! That is an amazing first quilt. I will comfort myself with the thought that I didn't take a class until I'd been quilting almost 20 years. I love that second quilt, too. It has such a cosy look to it! I really like the setting for your husband's plaid quilt! Homespuns are so appealing...instant coziness!